Author templates control the formatting and publishing options available to authors. Templates allow you to set standards and maintain consistency within your authoring team. A key capability of the application is the ability to allow administrators to establish and enforce standards through the use of author templates. Author templates contain configuration and style settings to control the appearance and content of your training materials. Templates help you to enforce consistency via these predetermined formatting and configuration settings. Consistent formatting enables your users to quickly and easily find information in all content. Sections - represents a single, contiguous group of blocks in a document. 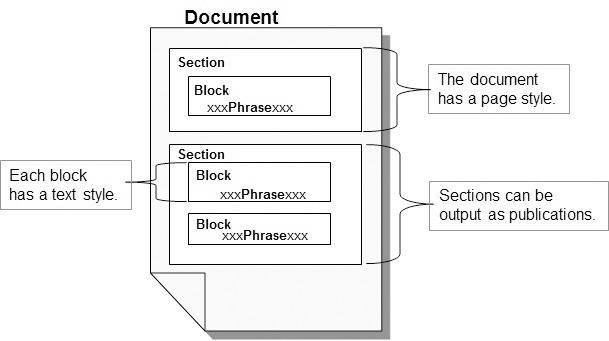 Blocks - a content element containing the information required to render a discrete item in all available views. Styles - a group of formatting options that relate to paragraphs or character text. Publications - a designator indicating content output. Phrases - a group of culture-specific boilerplate text items that are placed into a block by default. Properties - metadata such as document title, owner, and version used to describe content. Image, Data, and Language Management - allows you to control images, data fields, and languages associated with a template. Info Pak Properties - allows you to view a list of document types, content location, and websafe paths of migrated ANCILE Info Pak documents. You can edit author templates via the Editor.